Kidd, Thomas and Barry Hankins. 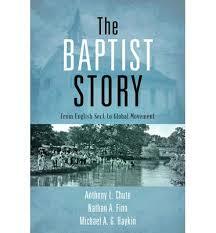 Baptists in America: A History. New York: Oxford University Press, 2015. 329 pp. Dever, Mark and Jonathan Leeman, Eds. 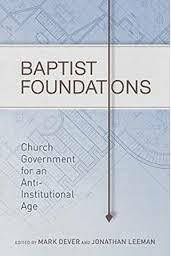 Baptist Foundations: Church Government for an Anti-Institutional Age. Nashville: B&H Academic, 2015. 397 pp. Global Movement. Nashville: B&H Academic, 2015. 356 pp. 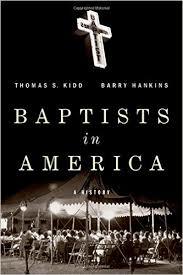 The “Baptist Summer” began on June 1st with the release of Kidd’s and Hankins’s much anticipated history, Baptists in America from Oxford University Press. As the title suggests, the work narrates the developments and movements within the Baptist tradition in North America from the colonial establishments of the mid-seventeenth century to the opening years of the twenty-first century. It provides the broad contours and context for the developing, differing, and at times divisive stream(s) of Baptist life and theology. Throughout its pages Baptist life is seen through the lenses of doctrine and divisiveness, salvation and schism, evangelism and exile. The work portrays the largely interconnected but fragile history of a branch of Christianity that is both widely diverse and genuinely interconnected. As a work of American church history, it particularly shows the history of Baptists as being that of religious outsiders and American insiders, at once both deeply immersed in the American experience of independence and progress, while being regulated to the central yet peripheral edges of society due to religious and biblical convictions. For those who love either or both church history or studies in Baptist life and theology, Kidd and Hankins provide a text that is both immersive and introductory. It is rigorously academic (while not being intimidating), well researched, grounded in primary sources, and written with secondary sources in view. It is the type book one might expect from historians as well-trained and credentialed as Kidd and Hankins, and it is the type of historical narrative one might expect from the Oxford University Press. In short, it is first-rate. One of the great advantages of the book is its laser-like focus on its primary subject. While not being an isolationist history, it restricts its own limits to one religious tradition on one continent over the course of nearly four centuries. For that reason, the book provides far more of an introductory primer on this one branch of Baptist life than one might expect from a history of Baptists as a whole. While being one of the books great strengths, however, that knowledge must come with a caveat (although that caveat is not necessarily a criticism). The interaction of the storyline with international developments is limited, and readers are expected to come to the text with a broader knowledge of Baptists within which to fit the narrative found here. This work is especially helpful for pastors, teachers, students, or laypersons who would like to broaden their own personal understanding of Baptists within the context of American history. It is written as an unbroken narrative and for that reason could be challenging for use in a small group study or with isolated readings. It is ideal, however, for personal reading, supplemental reading, or as an additional assigned work for the purposes of a paper or review in college or seminary courses on either Baptist history, American history, or the history of religion in the United States. The second Baptist book, released in June shortly after Baptists in America, is a work on Baptist polity entitled Baptist Foundations. It is the one work not directly related to church history and more firmly rooted in Baptist ecclesiology. Edited by pastor/elders Mark Dever and Jonathan Leeman, the book is in many ways a textbook introduction of Baptist polity that provides a compliment to the multitude of resources produced through the 9Marks ministry. Because it is so closely associated with 9Marks it generally provides a coursework in Baptist ecclesiology in broad agreement with the emphases of that ministry, even though various chapters are written by different contributing authors who do not always agree with one another on every specific issue. Baptist Foundations particularly provides a basic look at polity from Baptist theologians connected to the Southern Baptist Theological Seminary and Southeastern Baptist Theological Seminary. Over the course of five major sections the various authors in turn address issues related to congregationalism, the church ordinances, church membership (and discipline), the officers of the church, and local church cooperation. The section on local church officers (elders and deacons) receives the most attention with seven chapters devoted to its subject, while congregationalism and cooperation receive the least amount with two chapters each. Local church polity may still be a largely overlooked subject area within modern evangelicalism, but there has been a marked revival in polity studies in recent years. This is evidenced from the continued influences of ministries like 9Marks and recent rereleases from Banner of Truth like the classic work on Presbyterian polity, The Church of Christ. In its own way Baptist Foundations meets a need by providing a practical and introductory textbook/handbook on local church polity for a younger generation eager to rediscover the historic foundations of local church polity (without turning first to older authors like Dagg). By providing a resource with multiple authors it also allows readers to hear different voices speaking in close harmony, if not at all times absolute unison. As someone who has taken a graduate level course on ecclesiology taught by Mark Dever, this book is in many ways a condensed textbook of what that course’s subject matter contained. I would have liked to have found more interaction with more contemporary challenges to polity like church growth movements, the dangers of contextualization, multi-site models of local church life, and the modern evolution of denominational cooperation and/or networks for Baptist polity. With that being said, it is not much of a criticism to point out areas that the reader would have appreciated being included. No book can do everything, and what this book aims to do and does do, it does very well. As mentioned earlier, Baptist Foundations, can easily serve as an accessible introduction to Baptist polity for college and seminary students. In that service, it would be a helpful textbook used in collaboration with books like John Hammett’s Biblical Foundations for Baptist Churches, Mark Dever’s collection of historic Baptist documents in the book Polity, and John Dagg’s Manual of Church Order. Baptist pastors and other church leaders should especially have this resource on hand for teaching on and answering questions related to church governance and structure. Church planters would also find the chapters helpful as they think and pray through the initial steps of their own local church structure. Non-Baptists will find this to be a helpful resource for understanding the sometimes confusing (and always diverse) church life and structure of many of their Baptist friends. The Baptist Story, written by three church history professors, is the third and final volume in the Baptist trilogy to be released in the summer of 2015. It is a relatively short, one-volume introductory study of the history of the Baptist faith and tradition(s). It provides the broad strokes of the Baptist historical narrative and introduces readers to the major (and mandatory) movements and leaders (primarily in England and North America) from the early seventeenth century to the modern day. Of initial interest (whenever I am evaluating a new Baptist history text) is its stance on the origins issue, particularly related to how much of a connection to the Anabaptists does it assert as foundational for the birth of Baptists in Britain. While acknowledging similarities between the European Anabaptist movements of the seventeenth century, the authors assert (I think rightly) that similarity and even interaction does not necessitate (historically speaking) an obligatory or direct influence. The authors note that early Baptists (even those most like Anabaptists) went to great lengths to distinguish themselves from Anabaptists and would not have seen themselves as merely an offshoot or sect of the Anabaptist Brethren (pp. 11-14). What the book aims to do, it does well. It is not an exhaustive or even an “upper-level” history, and has none of the size and breadth of McBeth’s one-volume history or Nettles’ three-volume history. If you are looking for an in-depth study, the two resources mentioned above, along with the Kidd and Hankins book mentioned earlier, will be books you’ll want to spend time with. The one weakness of the work which is also one of its major strengths is its concise summation of the whole of Baptist History. So if you’re seeking a really well-written and relatively short introduction to the subject, there is probably no better resourced than this brand new release. The one awkward inclusion in the book is the final chapter on Baptist identity. The nature and characteristics of the Baptist movement is briefly summarized, but seems out of place following the general flow of the narrative that reaches its conclusion prior to the consideration of what exactly a Baptist is. The chapter would have perhaps been better served if placed as a longer introduction or a first chapter prior to the beginning of the historical narrative. That observation, however, may only be a personal opinion reflecting my own preference and not any real weakness in the work. In addition to its basic brevity, the text also provides substantial bibliographies of suggested readings for students who would like to delve deeper into the subject matter. At the conclusion of each chapter there are also study questions that make the work ideal for a classroom or small group setting. In a well designed textbook format the book also offers a number of helpful graphs, charts, illustrations, and photographs to illumine the written text. This text may readily be my most recommended “one-stop-shop” for a basic introduction to Baptist History. Pastors, laypersons, novice historians, and students should all find it an easy to read primer in its subject area. For teachers or pastors working to plan a class on Baptist identity and history, the length and format, and particularly the study questions provided at the conclusion of each chapter, allow for easy use and adaptation. It is ideally suited as a stand-alone college textbook or a church small-group or elective study. If used in a graduate level course, it may best be paired with another text like that of Bebbington, Nettles, Kid and Hankins, or Dever and Leeman’s book on Baptist polity. Cade Campbell is Associate Pastor for Preaching and Discipleship at First Baptist Church Henryville. You can follow him on Twitter at @DCadeCampbell.